Basically Austin is a town that the residents feel has been devastated by illegal immigration, and a lone resident, Sam Johnson, finally got fed up. He organized the first rally despite being up against professionally organized counter protests by the likes of La Raza, Centro Campesino and various Marxist organizations bussed in from the cities. Now, note that e-mail address: Yep, that's "NSM Southeast MN" -- or "National Socialist Movement Southeast Minnesota." You'd think that would have been a little red flag for Kevin Ecker. In case you’re wondering — and I doubt you are, but some people might not be able to view the picture — yes, that’s a guy wearing a neo-Nazi uniform. Because Sam Johnson isn’t just a hard-working white American who’s fed-up with illegal immigration. He’s a neo-Nazi, the head of the National Socialist Movement Southeast Minnesota. "Minorities should not be citizens," Johnson said, "only 100 percent true white Americans." He outlined his vision of a nation in which all people of color would be stripped of their citizenship, no matter how long their families had lived in the United States, and moved to communities that would be strictly delineated according to race. People of African descent would live with other people of African descent, Latinos with Latinos, Asians with Asians, American Indians with American Indians, and "real Americans" with other "real Americans. "Real American" and non-citizen status would be determined be having had family living in the country for five generations or 50-70 years. Only if non-whites broke the law would they be sent back to the country of their ancestors' origins, regardless of how long their families had lived in the United States. Of course, Johnson emphasized, this would dictate deporting all immigrants living here illegally. "Minorities could have jobs, own homes, and enjoy their own culture," he said. They simply wouldn't be citizens of the United States, nor could they become citizens. They would have to keep separate. 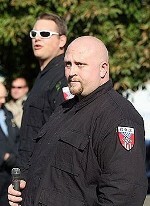 NOTE (10/27/09) : It has since been pointed out to me that Sam Johnson is, to put it lightly, a Neo-Nazi. Let me make it clear I do not endorse such a hate filled ideology and wish to express no endorsement of any such views. At the time I thought Sam Johnson was merely a small time illegal immigration activist, mainly cause I've never heard of him. I'm not of a mind to assume the worst motivations of someone plus googling a name like "Sam Johnson" seemed an act of futility at best. Knowing what I know now, no I would not have posted this and his entire event would have been forgotten, if not actively shunned. This is why those of us on the left don’t buy it when the right claims that they’re not racist — because they are so very willing to embrace racists when it helps them. If Republicans want to stop being seen as the party of hate, they need to stop the hatred. Otherwise, they need to own the fact that a sitting Republican congresswoman is a contributor to a website that promoted a neo-Nazi hate rally, promotion that included sharing Sam Johnson’s email address with those looking to get involved. Only a party that found racism acceptable could be comfortable with that. Indeed, as Phoenix Woman observed, it wasn't as if Ecker and his fellow Republicans shouldn't have known about Sam Johnson. He has, after all, been in the Minnesota news a lot lately. For instance, earlier this month he led a protest in Minneapolis outside a local YWCA, which was holding a diversity seminar, that was attended only by Johnson and three of his fellow neo-Nazis -- and several hundred counter-protesters. As you can see in the video above (compiled from YouTube videos shot at the event), the crowd not only shouted them down, but followed them to their car, and chanted "Don't come back!" as they pulled away. Johnson has also been at the center of a controversy involving NSM's attempts to hijack the war veterans memorial in Austin, Minn. So Ecker's claims of ignorance really only reveal his big blind spot: His refusal -- like nearly everyone else on the mainstream right -- to recognize and acknowledge not simply the existence of racist-right extremists like Johnson in their midst, but how they are empowered and enabled by mainstream conservatives. Ironically, much of this empowerment occurs because this blind spot ensures conservatives' failure to take a firm stand against the hijacking of their issues by radical racists. It's revealing, really, that Ecker simply dismisses the matter ruefully. There's no reflection on what role he might have had in helping empower Johnson, let alone on what the whole incident says about the dynamic of interaction between the racist right and conservatives, and how the racists make use of their issues and mainstream conservatives let them. Of course, we've been warning for a long, long time that the immigration debate has become a major recruiting device for racist radicals, enabled in large part by mainstream conservatives, including those in the media, who not only have blithely ignored the overpowering presence of real racist and nativist elements on their side of the debate, but in fact have blithely and even eagerly used these racists' talking points and claims (such as the supposed "Aztlan" conspiracy) to try to buttress their own positions. The answer, as we can see from this case, is simple: "No, we want to debate immigration without the racism too. But when you use racist arguments and empower radical racists in making them and promoting them, well, we're not the folks bringing racism to the table."